We landed yesterday and are now trying to get ready for work tomorrow (I am actually quite excited because this week I'll be preparing my plans for the six months to come). Still a bit jet-lagged. Today was a beautiful Sunday without cars in Brussels so we took the opportunity to visit the city on bike. I will continue posting material on this blog in the coming days and weeks since there is still a lot to be shared from our trip to beautiful Canada, like for example our meeting with a musician called David Ogalde in the old city of Québec; he plays the harp from Paraguay and it's just a magical experience to watch him perform. Luggage ready (in fact almost, since I still need to pack my laptop). In a couple of hours we will be flying to Europe; it's still September 15 here and we are exepected to land early afternoon on 16 September. First job will be to go pick-up my cat (see his blog) from the cattery (see their site here) where he was born and whose owners kindly offered to keep him while we were discovering Canada. I'll be posting some more material on Canada once we get back home. Pictures from our stay in Toronto are now online. Please check the side bar to the right or click here. Note: This post refers to the days we spent in Québec City between September 12 and 14. Wandering through the streets of Québec City, we saw many artists performing for passers by. Most of them were quite good and it turns out that the city authorities actually select those who are granted a license to play music or draw paintings in the streets of Québec. At some point we came across the street exhibition of a painter called Robert Charron. Among his paintings were a few fairly standard items showing parts of Québec and of the countryside around river Saint-Laurent. These were technically good, but not particularly remarkable; I don’t think they received enough attention and love from the artist. Much more interesting was another set of paintings combining colors and shapes in an odd, interesting and beautiful way. Some of them merely suggested the landscape or cityscape, while others were closer to surrealistic perceptions of parts of the city. These works had soul and somehow radiated something intense and deeply moving. We were lucky to speak with the painter called Robert Charron. This is his first year in the city's street exhibition and he seemed very proud and pleased to be there. 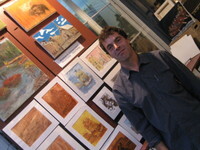 He had been selected in a contest organized by the City of Québec. He told us about how he creates, what styles he likes, what inspires him in choosing colors and scenes… A nice person with a remarkable style, Robert is an interesting artist who seems to be passionate about life. Robert also told us a folk story that is very ancient and very famous in Québec, the story of “La Chasse Galerie”. It speaks of times when the Catholic Church exerted almost absolute power here, banning everything unconventional, much to the dismay of a fraction of the population. Symbols abound in the tale and I think it gives interesting perspectives on the history of this city. Québec is definitely a place with a very unique mix of vibrations and a strange pattern of energy that is not simply the energy of a strategic military position that witnessed several violent battles. Here there is also the intensity of the times when Native Americans lived here. We arrived in Toronto yesterday, spent a lovely evening with our friends here and are getting ready to take the flight back to Europe tonight. There are still many things to say about this trip. Canada is a beautiful country with kind, friendly and lovely inhabitants; in our stay here we were impressed with the calm and quiet way in which most things are done. Pictures from Québec City are now available on the side bar. Notre séjour à Québec touche à sa fin. Nous avons vécu ici quelques beaux moments: entre la découverte d'une ville très chargée d'histoire et d'énergies des nations natives du continent, la rencontre improbable d'une belge émigrée d'origine Grecque (ils sont partout) et l'émotion provoquée par l'art Inuit, il y a bien des choses à raconter. Nous attendrons d'être à un endroit offrant plus de connexions wifi gratuites pour partager tout ça avec vous. L'heure vient de prendre l'avion pour Toronto et passer une bonne soirée avec nos amis Mike et Avideh. Encore le temps de poster quelque chose sur nos récentes découvertes linguistiques et nous filons à la porte d'embarquement. Aujourd'hui promenade dans la ville de Québec après une soirée sympathique hier qui nous avait déjà procuré cette sensation de déjà vu. Cette ville, vieille de 4 siècles, évoque beaucoup l'Europe. Seule cité fortifiée des Amériques, elle a beaucoup de charme malgré une grosse présence de touristes. Les photos seront bientot en ligne.